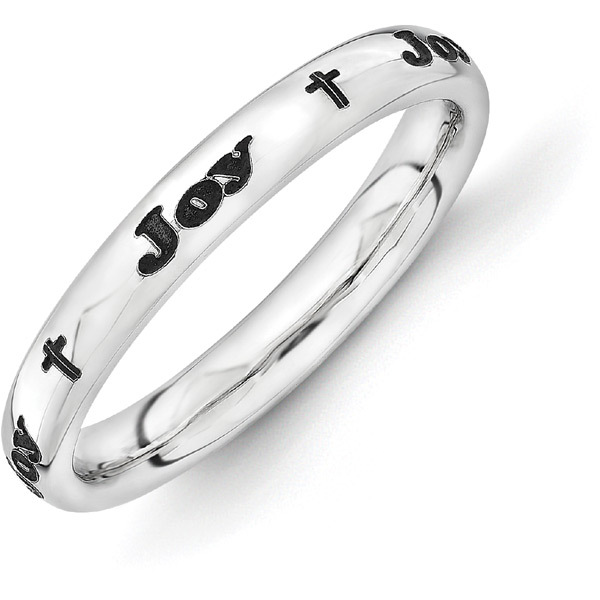 A personalized and black antiqued name ring with cross symbols in between the name, crafted in .925 sterling silver. The band measures 3mm wide and is available in women's full sizes, 5-9. The name repeats all the way around the band with the cross in between. Wear it as a stand alone ring or make several bands to wear as stackable rings. You can also add optional engraving to the inside of the band in either Block or Script font (up to 20 characters, including spacing). Also available with heart symbol or plain, shown below. We guarantee our Black Antiqued Personalized Name Ring with Cross in Silver to be high quality, authentic jewelry, as described above.